Innovation is increasingly identified as the critical factor in ensuring economic competitiveness. Departments of state and quasi-governmental organizations in many countries including, Austria, Australia, Canada, France, Germany, The Netherlands, Sweden and the UK, have issued reports and calls to action; but implementation will continue to be problematic unless the points made in this book are taken into account. Drawing on 350 in-depth interviews with senior managers, this book presents an original theory about the characteristics of managers in “good innovative organizations” and “poor innovative organizations”. It pays close attention to the attitudes, understandings, assumptions and interpretations of managers, who are often the ultimate decision-makers when it comes to innovation. The text is supported by real-life, internationally-known cases such as Hewlett-Packard, Zeneca and the BBC, as well as voluntary sector cases such as Oxfam. It is also enriched by substantial and highly revealing quotations from senior managers themselves. John Storey is Professor of Management at the Open University Business School and a consultant to leading corporations. He has authored and edited sixteen books on business, management and organizations. He is a non-executive director on two management boards. Graeme Salaman is Professor of Organizational Studies at the Open University Business School. He has worked as a consultant in eight countries for clients such as Sun Microsystems, Willis, BAT, the government of Ethiopia, Fujitsu, Allianz, Ernst and Young, Rolls Royce, and Morgan Stanley. 1. Innovation: Problems and Possibilities. 2. The Current State of Knowledge about Innovation. Part II: Managers' Accounts of Innovation. 3. From Tight Control to the Edge of Anarchy: Managing Innovation in Telecommunications. 4. Managing Creative Workers in an Innovative Way. 5. Contrasting Approaches to Innovation in Engineered Manufactured Goods. 6. Innovation in the Voluntary Sector. 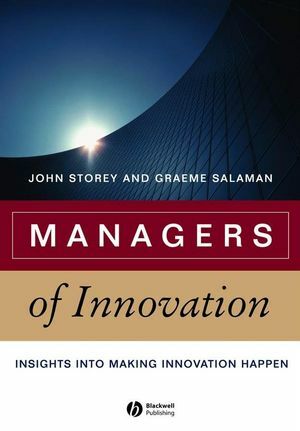 This book looks at how to foster innovation in organizations, focusing on managers as the key participants in the process. Presents an original theory about the characteristics of managers in “good innovative organizations” and “poor innovative organizations. Pays close attention to the attitudes, understandings, assumptions and interpretations of managers. Uses real-life case studies to illustrate its argument, including Hewlett-Packard, Zeneca, the BBC and Oxfam. Based on a new data set of 350 in-depth interviews with senior managers – the largest study of its kind. Enriched by substantial and highly revealing quotations from senior managers.